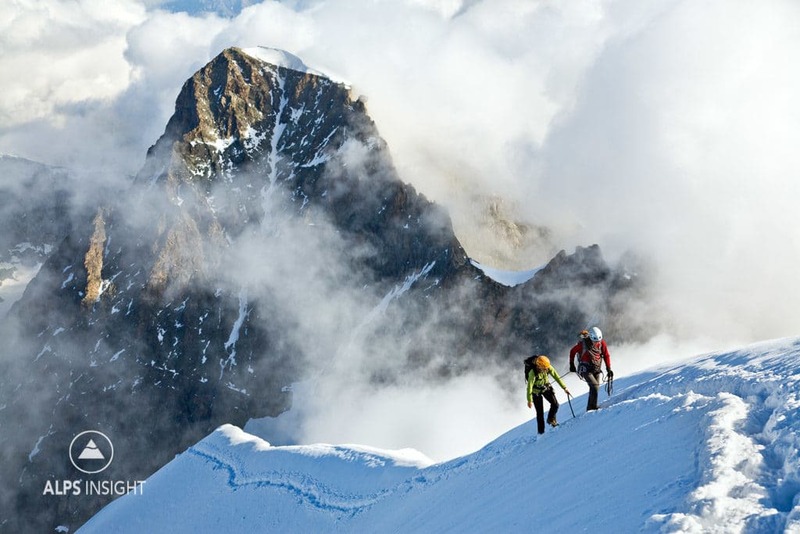 Reasons to hire a mountain guide for a trip in the Alps. 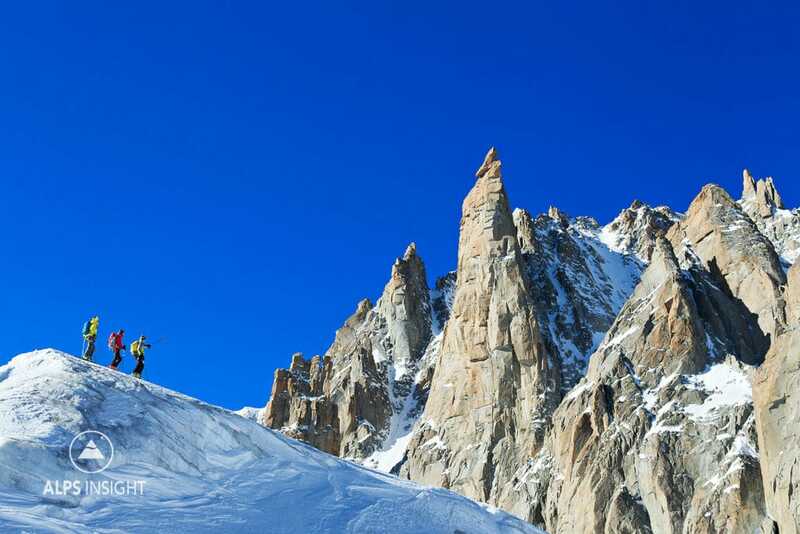 While hand-picking our Top Tours of the Alps, one thing became clear: we can only do so much to help with mountain experiences on a website. Anyone using ALPSinsight needs to have sufficient skills to head into the Alps on their own, or they need to hire a guide. Sure, anyone can land in Geneva and charge into the Alps with a bag of ski/climbing/running gear and have a great time. But, the entire experience can change due to bad weather, an inappropriate objective, misunderstanding the goal, a logistical screw up, or just bad luck. This is where experience plays a role, typically in the same mountains. Without that experience, things are iffy. A lot of people won’t hire a guide because of the added cost and the feeling of not needing one due to experience and style, and I get that. I’m suggesting that many more can benefit from going with a guide after realizing just how much richer of an experience people tend to have. Short roping on the Piz Bernina’s Biancograt, the Alps’ easternmost 4000 meter peak. Everyone has expectations, the more you have that revolve around comfort and luxury, the more variables you’ll have when it comes to organizing the experience. If you want to have fresh clothes, a light pack, a little more privacy, a shower, good food and plenty of time to enjoy it all, you might consider a guide. If you’re cool with two weeks in the same clothes, sleeping in rooms full of strangers, and eating whatever is cheap and easy, then you’re easy to satisfy and probably fall into the do it yourself category. But that doesn’t mean the right trip wouldn’t be better with a guide. Speaking for myself, I’m somewhere in between. I’ve been the dirtiest of dirtbags, but as I’ve grown older, I’ve also grown to appreciate some comfort. 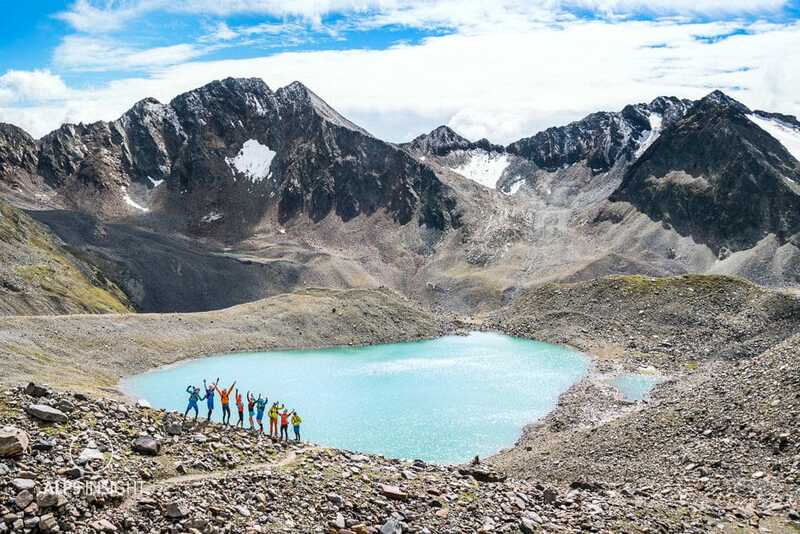 The guides I’ve hired in the mountains of Nepal, Peru, Bulgaria, and Kyrgyzstan made my time in these places much better. They eased me through the logistics, made my time efficient, and showed me experiences I might have otherwise missed. If you’re in the Alps for the first time, spent all that money to get there, and you have always wanted to do that big thing, don’t you want to do it right? And if you can’t do it because of weather or conditions, wouldn’t you hope that you could do the next best thing? Like you would at home where you know the options inside and out? Like the local guide in the Alps will? Big groups can be big fun when trail running. Ultimately, no one seems to regret using a guide, instead we recognize that it was a great decision. With that in mind, we’ve come up with our ten best reasons to go with a guide. The obvious one, especially if you are climbing or ski touring, or going on a glacier for any reason. The Alps are full of hazards, guides are going to help minimize risk. Tip: Guides carry a radio that works everywhere in the Alps for the most rapid rescue response. In the Alps, there are a lot of logistics! Trains, taxis, trams, huts, luggage transfers, hotels, and then modifications to all of it when the weather doesn’t cooperate. With a guide, it all gets done in the most suitable style for your needs. Tip: A common issue in the Alps is that people book hotels on Booking.com and score a great deal just 15km from the town they need to stay in, only to discover that the 15 kms to their hotel takes 90 minutes to drive. It’s in the opposite valley, and there is a mountain in between. If you have one big thing in mind that you want to do and the weather shuts you down, you need a plan B. Guides have Plan B – R all at the ready, and all good. Guides will quickly get to know you and customize the experience along the way. Do you love making social media hero shots? You’ll likely be pointed to the best opportunities. Need coffee within 45 seconds of waking? A guide will probably help facilitate that. Plus, a guide will tune in to your skill level and choose the right experience accordingly. Don’t get in over your head and regret the whole thing. Trust that you’ll be directed to the right objective. Cycling guides have a huge offer for their guests that is somewhat unique to cycling… hidden, or lesser known, roads. 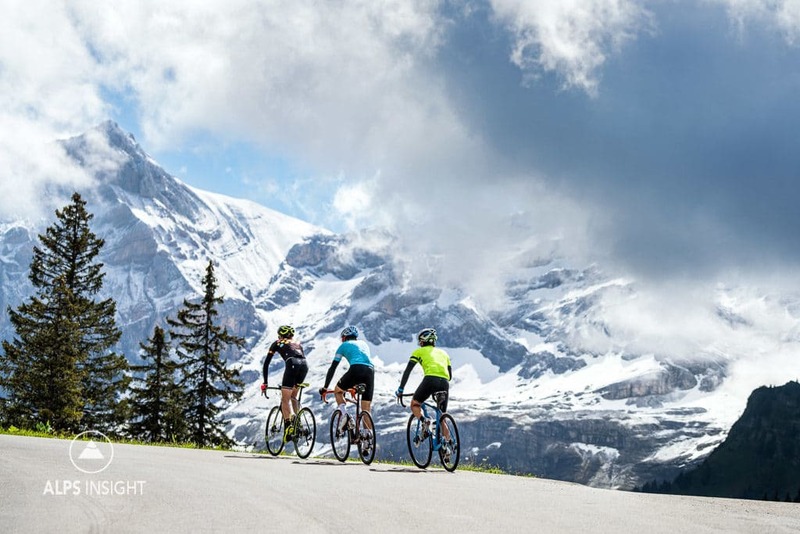 Sure, ski touring has some locals-only lines, and running may have a secret trail or two, but cycling is where the local knowledge shines, especially in Europe where there are roads everywhere. Most every cyclist is going to ride the famous loops and passes, which are often busier. When you live in the Alps, you just know so many more options, and now, with gravel biking taking off, there is potential everywhere. Tip: Word is that when a husband & wife teams book a guide, they tend to have a much higher likelihood of not wanting to kill each other at some point on their trip. About everything. Wouldn’t you rather be making turns over deciding which train to catch to get to the airport? Or, re-booking all your accommodations because you got delayed one day due to weather? Tip: Guides may modify tours for no apparent reason, but here’s the reason, and it’s kind of a secret… you might notice that at some point in the hut each evening, all the guides disappear at the same time. They’ll be absent for about 30 minutes and when they return they will have 1) a smile on their face, 2) some news and 3) smell faintly of schnapps. It’s a tradition, and you, the client, benefit. They all gather for what they term the Apéro des Guide, in the hut’s kitchen, where they share info about conditions. If it’s ski season, you’ll probably be veering slightly off schedule to ski powder stashes the next day. Enjoy! Tip: Learning is fun! And, you may well discover your next trip. Abundant time spent in the mountains tends to generate some great stories, some are even true. Guides have the best stories! Provides a booking service much like a far more expensive travel agent. Can tell you what the final cost of the trip is going to be, no surprises! If necessary, adjust accordingly. Can occasionally book lodging for lower prices. Locks you in to their system which is well thought out and efficient. Tip: Don’t forget to tip your guide. You will have an inspiring, fun, travel partner that you can count on in every way. Tip: Be a bomber companion back. One of the greatest things you can get from a guide is knowledge, not where the best pow is, but for your own mountain skill education. 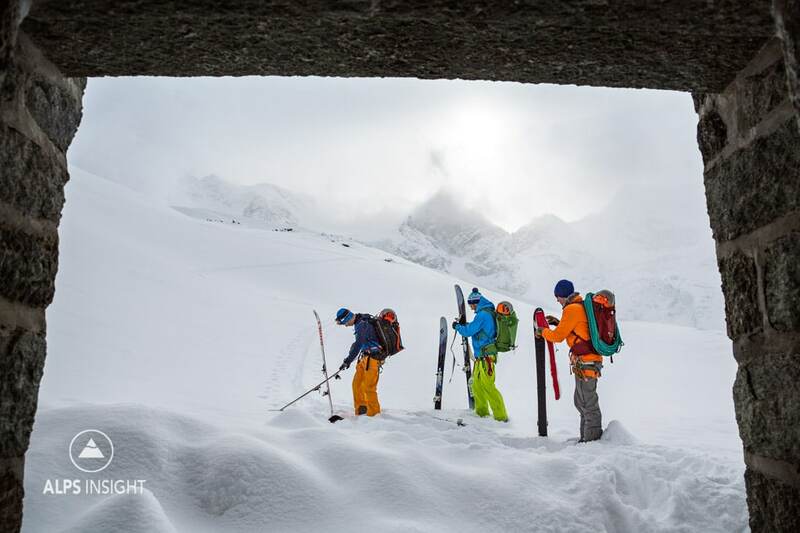 Their job is, first and foremost, to keep you safe and having a great time, but if you pay attention and ask a few questions, you can learn a lot about glacier travel skills, navigation, fast and efficient climbing systems, ski tricks, local info, and so on…. Tip: Pay attention and learn something, even on holiday. Leaving the hut behind for a big day of skiing. Because we get asked so much about which guides we recommend, we compiled a list of close friends, who we know to be fantastic to work with, and fun to be with. They’re all Alps-based, and scattered from Chamonix to the Dolomites. We’d love to connect you to the right guide for what you have on your life list. Finally, have you used a guide? If so what was your experience? Instead of client stories… let’s hear some guide stories! ALPSinsight’s own Alain Rumpf is a bike guide with a lot of secret routes up his sleeve.